With Cater Hall and Kendra Saunders hidden on a remote farm, Team Arrow and Team Flash begin work on a plan to deal with the immortal Vandal Savage. At the same time, Oliver Queen begins to investigate his long-lost girlfriend - and her son - in secret. Merlyn's threat to kill Oliver if anything happens to Thea rings kind of hollow since the actions sparking the threat (i.e. not doing what Vandal Savage says) will almost certainly result in Oliver's death anyway. Felicity says it will take a while for her to find a way to play the Betamax tape Diggle gets from ARGUS. It literally takes her about five seconds. Did a scene get cut here? Whatever her name is, Oliver's ex's demand that he not tell anyone about his son - not even his girlfriend - is incredibly unreasonable and nonsensical given her desire to keep Ollie and his crazy world out of their life. Strangely enough, the supporting cast doesn't get as much to do here as they did in Part One. So there isn't as much opportunity for everyone to shine and most of the cast is just there for most of the episode. That being said, the interplay between Carlos Valdez and Ciara Renee continues to be the best part of the episode, with Stephen Amell's performance in dealing with his sudden fatherhood running a close second. As our heroes arrive at the remote farm house, Thea comments that she thinks she saw this in a movie. This is a reference to Avengers: Age of Ultron, where The Avengers did indeed take refuge at Hawkeye's family farm. Vandal Savage instructs The Flash and Green Arrow to bring Carter and Kendra to Jurgens Industrial. This could be a nod to comic writer and artist Dan Jurgens, who has written and drawn Green Arrow in the past. The man on the tape Diggle finds - Dr. Aldus Boardman - says he is a professor at St. Roch University. St. Roch was the town in which Carter Hall and Kendra Saunders reestablished themselves in the 2002 Hawkman comic. St. Roch is modeled on New Orleans and named after a district in the city's 8th Ward. Nth Metal is a semi-mystical element native to the planet Thanagar in the DC Comics Universe. Nth Metal has a number of properties, including the ability to negate gravity, heal wounds, protect against extreme heat or cold and increase the strength of a person wearing an object made of it. It was Nth-metal belts which allowed Hawkman and Hawkgirl to fly and may have been responsible, in part, for bringing about their reincarnation. In the original comics, Vandal Savage's immortality came about because of exposure to a radioactive meteorite as a primitive caveman. In the revised origin for Hawkman and Hawkgirl written by James Robinson, David Goyer and Geoff Johns, the spirits of Prince Khufu and Chay-ara were reincarnated numerous times across the ages, with the treacherous priest who killed them - Hath-Set - also reincarnating to kill them. These two origins are merged somewhat in the DCTVU. Here, Vandal Savage - a seperate character in the original comics - is revealed to have been Hath-Set and his immortality was fueled by his sacrificing the two lovers whenever they were reborn instead of being reincarnated as the comic version of Hath-Set was. His immortality is also fueled by the "sky rocks", which are said here to made of Nth Metal - the unique properties of which also had a hand in fueling the reincarnation of Prince Khufu and Chay-ara. Caitlin, Cisco and Felicity guess that Insulated gauntlets with magnetic shielding might disrupt the staff's magnetic polarity. Egyptians used meteorites in their craftsmanship. The two gems in the Staff of Horus are composed of what Cisco dubs Nth Metal. They glow in close proximity to each other.Cisco theorizes that two pieces of Nth Metal might neutralize one another. He can synthesize a compatible isotope out of the meteorite Barry retrieves and coat the gauntlets with them. Oliver: While they work to get the staff away from Savage, we need to know everything there is to know about him. Thea: Well, I Googled "reincarnated nut jobs" and came up with nothing. Carter: Kendra and I would be the reincarnated nut-jobs. Savage is merely immortal. Thea: Really?! Welcome to the new normal! Oliver: Well, we're up against an immortal madman armed with a magical staff. So I do have a few things on my mind. Felicity: Yeah, but you were acting fine with everything when we were home. And now that we're here in Central City you've just been not... you. Oliver: Well, maybe it's too bright and sunny for me here?! Kendra: You know, we should talk. Cisco: Never in the history of romance have those words ever meant anything good. Green Arrow: Thank you for coming. I know this is more than a little crazy. The Flash: Yeah, well, your friend with the creepy ring asked so nicely. Please tell me we're not going to negotiate with terrorists? Or, you know, 4,000 year-old bad guys? Green Arrow: Just think of this more as a fact-finding mission. Maybe Savage slips up and gives us something we can use to our advantage. Merlyn: (scoffs) Thea said you were being a little more humorous lately. The Flash: I'm sorry - how do you know so much about Savage, anyway? Merlyn: I don't know anything about him, Mr. Allen. No one does. And that is why I'm afraid of him. Vandal Savage: That's not the only reason to be afraid of me... I assure you. Vandal Savage: The only way for you and yours to live through this is to render unto me what is mine. Turn over Prince Khufu and Priestess Chay-ara within 24 hours or I will lay waste to this city, killing everyone that you hold dear. (Savage turns to Green Arrow) And after that I will travel to your home. And do the same thing there. The Flash: I'm just curious - did you rehearse that speech in a mirror this morning or is this all off the cuff? Vandal Savage: (chuckles) Why would you risk the lives of your friends and family for two strangers? 206 times I have killed him. What hubris possesses you that makes you think you can prevent me from doing so again? The Flash: Not hubris. Hope. Cisco: Okay, um, all right, look...don't panic! A) You don't know that you time-jumped for a bad reason. It could be a good one, right? B) Now that you know you time-jumped, you might not do it, right? So knowing the future, might change the present, which might change the future. Kendra: Everyone in there is willing to die to protect us. You don't think that's a little bit insane? Carter: No. I think it's noble. I think it's what makes them all heroes. Kendra: Yeah, well, heroes or not, I'm not letting anyone die for me! Carter: Then don't. Be the person... the woman... the warrior you are meant to be. The one you always have been. Felicity: Stop! I cannot hear another lie! Felicity: God, Oliver! You are the only person on this planet who considers the truth complicated! Just to be clear, I don't care that you have a child. I can't believe that you have a child that you didn't tell me about. I care that you lied to me just now! Oliver: You know that my whole world just exploded? And I think that I'm entitled to a... a minute to process that by myself. Felicity: You somehow managed to go tot he CCPD to track down Barry. So you didn't keep it to yourself. You kept it from me. When were you planning on telling me? Oliver: ... I don't know. Felicity: If you loved me.... if you trusted me, telling me this wouldn't be such a burden. It would be a relief! But you don't trust me! You never will! And how can I be with someone who doesn't trust me?! Vandal Savage: It's wonderful to see you again, my love. Kendra: I will never be your love! Vandal Savage: I know. (draws a knife) That always makes this easier. Kendra: Ever since I emerged, I've been remembering our first life in Egypt. But I've been telling Carter I can't remember anything because... because I don't want to accept that I'm some reincarnated Egyptian warrior priestess! Cisco: Okay. Yeah. That's pretty heavy. But it's also pretty amazing! I've been through this. You know I have. And what you're going through right now... this is a gift! It's a miracle that most people don't get to experience! Kendra: Yeah, well it feels like a nightmare. Cisco: Yeah, but that... that is a chocie! You can choose the other things... to remember who you are. Or who you were. Ollie: (chuckling) I'm not really a hugger. Barry: Yeah, tell me something I don't know. But the thing is I am fast enough to just hug you without you knowing, so you might as well let me. Barry: That wasn't so bad, was it? Chay-ara was a priestess of Horus. Caitlin refers to how the first Arrow Cave was discovered by the police in 318 and the second was uncovered by Double Down in 403. According to Carter, he and Chay-ara have to seek out their helmets in each of their new lives. Samantha's son is named William. Ollie palms some of his hair from a ball-cap after "accidentally" knocking it out of Samantha's hand. Vandal Savage claims to have taught Robin of Locksley how to use a bow and that he taught Savage how to not feel pain. According to Carter, Vandal Savage killed two million people in 1887 during the Huang He Floods to get to him and Kendra. As in F115, Barry sees a "ghost" of himself while running at super-speed, as he did right before the first time he time-traveled. Barry conducts a DNA test that confirms that Oliver is William' father. Oliver finds out about the deal that Moira made to pay his ex-girlfriend one million dollars to lie about miscarrying.in A222. He also discovers that the check was never cashed and that Samantha is determined to keep Oliver out of her son's life. Ollie tells Barry to "run, Barry, run". This is the same catch-phrase Eobard Thawne used to tell Barry when encouraging him to run faster. Barry time-jumps while trying to outrun the blast from the Staff or Horus that destroys Central City and kills all of his friends. He arrives just at the beginning of his meeting with Ollie, Merlyn and Vandal Savage. In the new timeline, Barry tells Ollie about everyone dying, Kendra's powers and the special-gauntlets failing and warns Ollie about his conducting the DNA test in secret. He tells Ollie what he guessed about Ollie having fathered a child. This leads to Ollie asking Cisco to triple-check the gauntlets and advising him to talk to Kendra instead of leaving Carter to train her. This leads to Kendra having a full vision of her original death and remembering the strange "sky-rock" metal used by Hath-Set. This leads Cisco to use the same metal on the gauntlets to counteract the Staff of Horus. And that leads to Oliver deciding to take the whole team into the field rather than just himself, Barry, Carter and Kendra. Kendra and Carter leave to go to St. Roch. Cisco makes Kendra a medal of Nth Metal with a micro GPS chip embedded in it. Oliver winds up agreeing to Samantha's terms - she will allow him to see William but only if he agrees to tell no one - not even Felicity - that he is William's father. And William will only know him as mommy's friend. 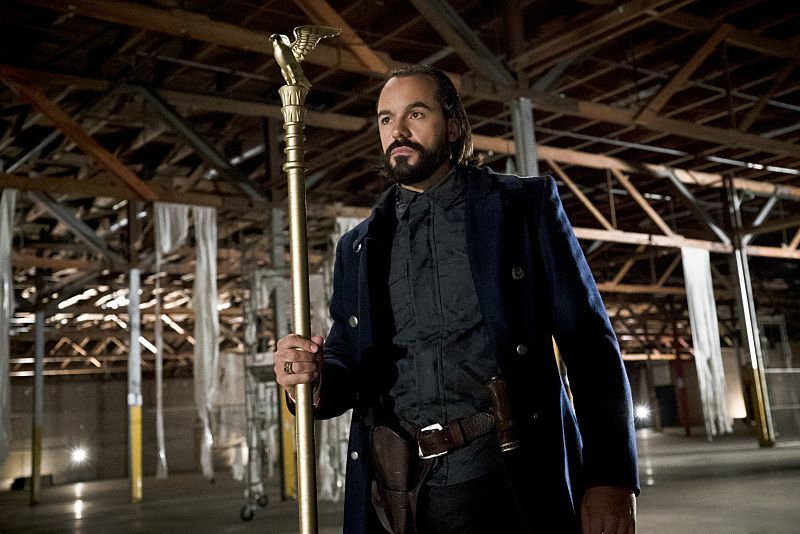 Merlyn gathers up Vandal Savage's ashes at the episode's end, saying that Savage will owe him one. Most of the episode takes place in Central City. The flashbacks take place in the Middle Kingdom of Ancient Egypt, during the time of Ramses The Wise. Felicity, Laurel, Thea and Caitlin are left on the sidelines for most of the episode. There's so much wrong with Kendra being dependent on either Carter or Cisco to access her powers reliably. You'd think Ollie would have learned his lesson by now about trying to keep secrets from his loved ones and that agreeing to Samantha's terms would be really stupid. It isn't bad but it's a bit of a disappointment after Part One. Carter still isn't developed very well and the Cisco/Kendra romance ends as quickly as it began. Oddly enough, Barry and Cisco take center stage for most of the episode while the rest of Team Arrow is side-lined. And the subplot with Ollie and his illegitimate son seems forced and serves no purpose other than to set up a future wedge between himself and Felicity.